Fuller Brush products are still around. Within the past couple of years I've purchased a wet mop and a dust mop of theirs. I believe Lucille Ball also starred in a Fuller Brush movie by another name, of course! 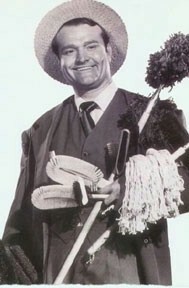 I think Red Skelton played The Fuller Brush Man in that movie. Is it just me?...doesn't the guy look like Red Skelton? Fuller Brush was one of those great companies that made stuff without planned obsolescence. Their products simply lasted and lasted! Maybe that's why they're no longer in business???? They made really great products, I had a hairbrush for over 30 years. The handle on the brush just gave out one day and I wish I could have found another just like it. Remember also the Kirby and Electrolux vacuums that they came dor to door to sell. The demo was always the best, throwing lots of dirt on the carpets to show you the power of those machines.